Deseed and thickly slice the peppers. Brush with olive oil and griddle until softened. Slice the haloumi, brush with olive oil and griddle. Make a dressing from the capers, Dijon mustard, basil leaves, lemon juice and olive oil. 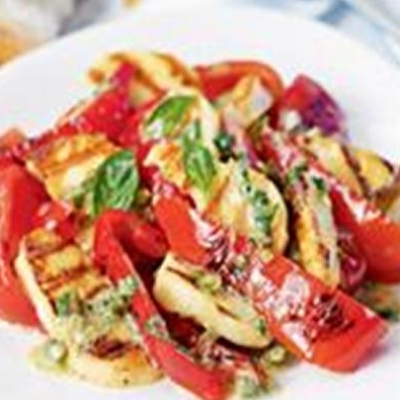 Pour over the peppers and haloumi in a bowl and serve with crusty bread.